Was part of the matchday staff for League One clash at Bloomfield Road. 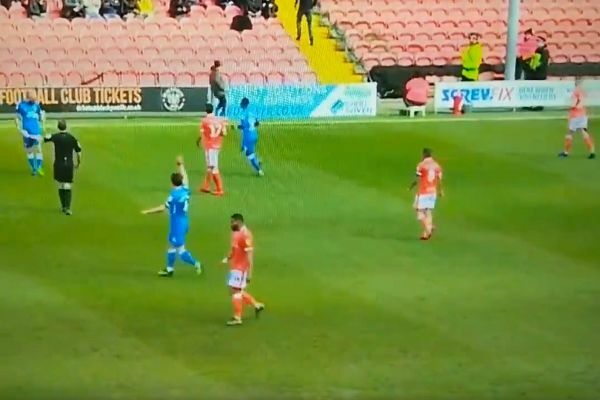 A steward at Blackpool was hit on his head by the ball during a 0-1 defeat to Peterborough United in League One on Saturday. The stadium official at Bloomfield Road was sat on a stool facing the fans with his back to the pitch when he was unsuspectingly struck by a wayward clearance. On a cold weekend in April in the seaside town, the man was well insulated but barely moved after the ball landed directly on him and bounced back. A throw-in for the home side was awarded and the game continued on the pitch without him even turning round.